Record Breaking Volunteer effort in 2018! The Fix the Fells Volunteers have had another record breaking year in 2018, delivering more for the Lake District environment than ever before. This army of outdoor enthusiasts spent 2,500 days in the fells, looking after the mountain paths – a record number of volunteer days for Fix the Fells volunteer scheme since it began 11 years ago. The volunteers now routinely monitor or maintain 335 paths covering over 400 miles across the Lakes. They support the Fix the Fells Rangers who carry out major path repairs every year from March to October. The volunteers undertake regular path maintenance and complete smaller path repairs throughout the year. In 2018 they undertook 175 “work parties” to repair sections of path. Their work party activity increased from a total of 802 days in 2017 to over 1000 days in 2018 – another new record volunteer achievement. Work parties took place on Grains Gill in Borrowdale, Wansfell near Ambleside, Coniston Old Man, Mires Beck and Gowbarrow near Ullswater, Dollywaggon Pike on the Helvellyn ridge, and Lingmoor Fell near Langdale. A total of 645 “drain runs” were undertaken, where the volunteers venture on to the fells in all weathers to clear the drainage channels in the paths and ensure damaging water is shed from the path surface so that erosion is reduced. In the last four months of the year (September – December 2018) one hundred percent of the scheduled “drain runs” were completed in all areas of the Lake District – a new first for FtF! 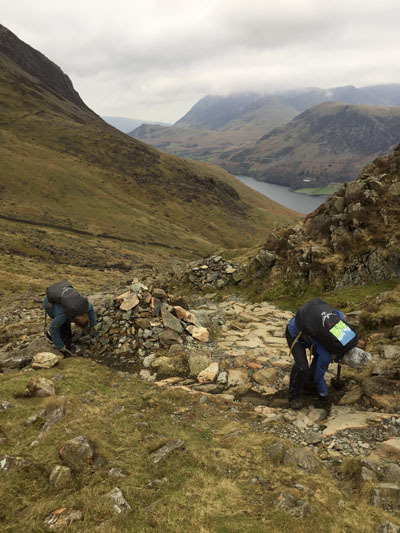 A total of 110 different Fix the Fells volunteers contributed to the overall activity in some way in 2018, with 74 volunteers contributing at least 12 days (ie once a month), which is the minimum commitment asked of Fix the Fells volunteers in return for the training they receive. 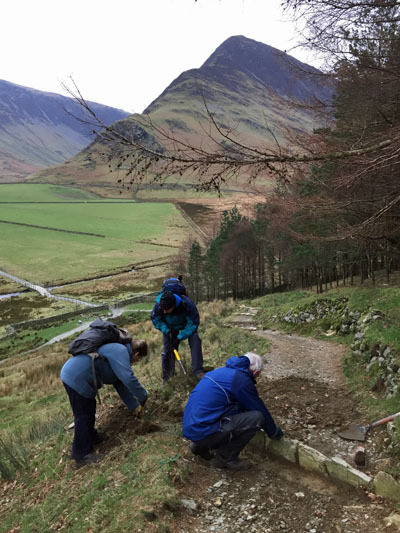 Joanne Backshall, Fix the Fells Programme Manager, said: “The Fix the Fells Volunteer Lengthsmen are an amazingly dedicated group of people who turn out several days every week, whatever the weather, to look after the Lake District’s upland paths. Fix the Fells works to protect the wonderful Lakeland landscape and wildlife, which is enjoyed and valued by so many people for their physical, spiritual and mental well being. This high level of use is not sustainable without some intervention and we need to spend £500,000 every year to repair erosion damage. The Fix the Fells volunteers are known as “Lengthsmen”. This is a term from medieval times when lengthsmen would be paid to walk the length of the parish and repair any roads and unblock ditches. In 2018 eight of the volunteers reached the milestone of having been in the Fix the Fells Lengthsmen Scheme for 10 years. This fantastic commitment was recognised and celebrated at the annual festive get-together hosted at National Trust High Wray Basecamp volunteer centre.